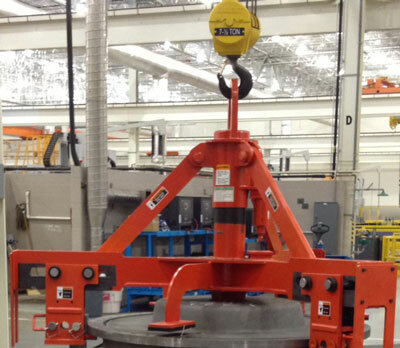 The lifters are rated for 12,000 lbs capacity and weigh 1,400 lbs each. They are used to lift and move welded frames by gripping a slewing ring bolt flange without damaging machined surfaces. The operators used to manually rig chain slings to the frames, which was time consuming and posed safety risks. The Bushman lifters can grip a broad range of flange diameters without manual intervention. This reduces set-up time and reduces the safety hazards that come with manual hitching.